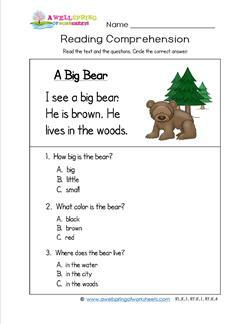 Please go to this page to choose from all the reading comprehension worksheets on this site. These kindergarten reading passages are designed to build confidence and success in kids who are answering multiple choice questions for the first time. Two simple sight word rich sentences are repeated in the two multiple choice questions. The simple sentences are on one line only. Children circle A or B to show which is the correct answer. Hint: The correct answer os a repeated line from the text. Themes in these worksheets include snow, animals, flowers, colors and more! 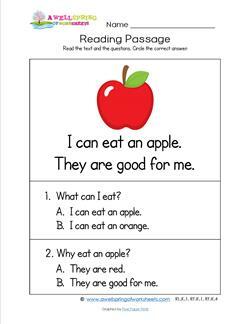 In these kindergarten reading comprehension worksheets kids get to practice their reading skills at a step just above our kindergarten reading passages. Kids read three short sentences and answer the three text-based multiple choice questions. Many sentences carry over to the next line. Each passage has a title. Topics include the love of reading, children being proud of themselves, toys, animals, rain, friends, kites, little red wagons, and much more! More reading for kindergarten! This set differs from the other sets of kindergarten reading worksheets in that there are four sight word rich sentences (instead of two or three). The three multiple choice questions have answers that need to be bubbled in (instead of circling the correct answer). Also, each reading worksheet uses at least one exclamation point or question mark to add excitement, intrigue, and use of the imagination. Topics include farm animals, a dress, pumpkins, popcorn, a boat, and a pet dog. Kindergarten short stories to the rescue! And by short stories, I mean a few very short paragraphs. These comprehension worksheets are for very advanced kindergarten readers. Each worksheet uses quotation marks for between one to four different speakers. Some passages are longer and more complex than others. The number of sentences varies by worksheet. All have kid-friendly content including stories about insects, rainbows, food (yum! ), instruments, playing games, and more!